with the thought of writing an outfit post in mind. But... we kind of got sidetracked. As you can see. 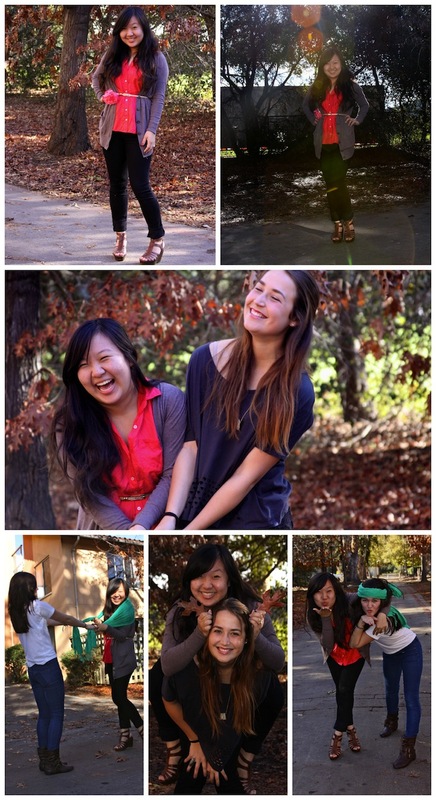 A camera + friends = just too much fun. I'm not a fashion blogger. So why am I impersonating one? Because I had a good hair day. And a cute outfit day. so maybe there will be more "outfit posts" to come? Also, immediately after taking these pictures, we went to the airport to pick up Cassandra's friend Caitie but the baggage claim was malfunctioning & we were looping around the airport. We made about seven loops total, but you guys... if you're ever bored at the airport waiting to pick someone up - just loop around and around, making up stories about the people waiting outside. It's just about the funniest thing you'll ever do. cute and classic! can never go wrong with jeans and a belted cardi! Ok the title of this post got me excited, and you did not disappoint my friend!! Such a cute outfit (and hair). You need to make these posts a more regular thing! Cute post! You guys look like you're having so much fun. Such a cute & cheerful post! And...loving those brown wedge sandals! aww cuteness! LOVE THOSE WEDGE SANDALS! you girls look like you're having such a fun time with your outfit photos hehe! All of your photos look so fun. Haha wish I could hang out with you for the day! I love how you styled that skinny belt. Keep rocking the cute clothes and good luck this week for school! You guys always look like you're having fun. I love it! Believe me, you're not alone! I've started doing outfit posts, and I think taking pictures are the best part (the narcissist in me comes out). This is a really cute outfit - love the belt. you are so so adorable. you always look like you're having fun. These outfits are so fun! You all look great! great pictures and of course a stylish outift. Those autumn leaves looks so crispy in the background and both of you look like that shoot is a lot of fun! Full of character. You and your friends are adorable! It looks like yall had a blast! Your outfit post is so cute and fun!! You and your friends are so cute! Nice photo and really cool outfit, you look great, I like your top, what a great color and that cardigan is so nice, the perfect touch to the outfit also you are really beautiful and your shoes rock! Your have a lovely blog by the way and I am a new follower! Hope you will like my blog and follow back!